I like this warm colours of the background a lot. The background is very nice, I especially love the color scheme you chose. The leaves are great, nice job there. The branches look terrific up at the top, but get kinda wonky where they overlap the scans. The characters are beautiful...wherever did you find them? That's a great pose, and you can just feel the emotion. The title and graphic also look good. They fit the wallpaper nicely without taking away from it. Terrific wallpaper, thanks for posting it for us to enjoy. nice wallpaper, i like the warm colors, and the two charas look so cute togetehr. Very nice work! Worthy of a Fav. If only "our" dance could have lasted longer.. sigh..
i have just fiend this wall of yours onestepclosertonumb on the CW group..
so nice..the couple is so sweet..and you used so warm colors .. I saw this wall at the Colorful Wallies Contest and fell in love. Simply beautiful. Warm and gentle, I like the colours and the mood of this one. 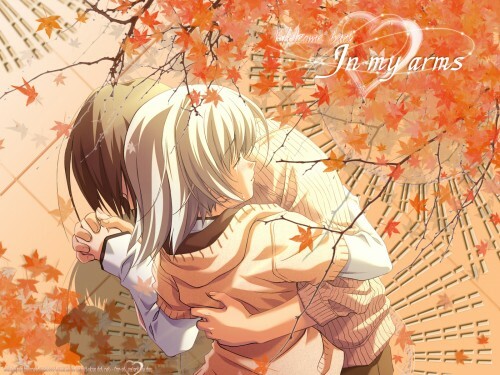 the autumn background is really cool and it's like oozing vivid memories of the couple .. so romantic!